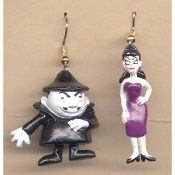 Funky BORIS and NATASHA EARRINGS - Rocky and Bullwinkle Novelty Toy Mini Figure Costume Jewelry - Who are the EVIL SPY VILLAINS of Cartoon Characters ROCKY and BULLWINKLE ??? None other than Boris Badenov and his evil cohort Natasha Fatale. Yes, Viewers, they've been sent to cause great mayhem by Fearless Leader. Our non-suspecting Heroes would never be expecting this! It's None Other Than Their Arch Enemies . BORIS and NATASHA Daaarling . Undercover as EARRINGS - Who would believe it? 1- pair (1-each of 2 different figures, as shown) Wear just one, or the Mismatched Set. Rubbery Plastic Charms, each approx. 1.5-inch (3.75cm) tall.